Trial applications for the 2017/18 Chester FC Player Development Centre (PDC) programme are now being invited. Created in 2016, the PDC provides increased opportunities for talented young players to train in a professional environment designed to help them reach their potential. Players successful at the assessment stage continue to train and play for their grassroots clubs with the PDC offering a 20 week training programme in line with The FA’s four corner model and Chester FC Academy’s development principles. The PDC incorporates a games programme and provides a route into the Chester FC Academy for players who display exceptional ability. The 2017/18 PDC programme will be based on 3G pitches at The Cheshire County Sports Club and Blacon High School, and feature the following age groups: U6s (Year 1), U7s (Year 2), U8s (Year 3), U9s (Year 4), U10s (Year 5), U11s (Year 6) & U12s (Year 7). Assessment sessions will be held at Blacon High School with dates to be advised. Prospective players who wish to attend these trials can request a registration form via community@chesterfc.com. Jim Green, chief executive of Chester FC Community Trust, said: “The response to the PDC has been fantastic and we’re very pleased to confirm details of the 2017/18 programme. The cost for the full 20 week programme is £60 (equivalent to £3 per week) which can be paid in three installments. 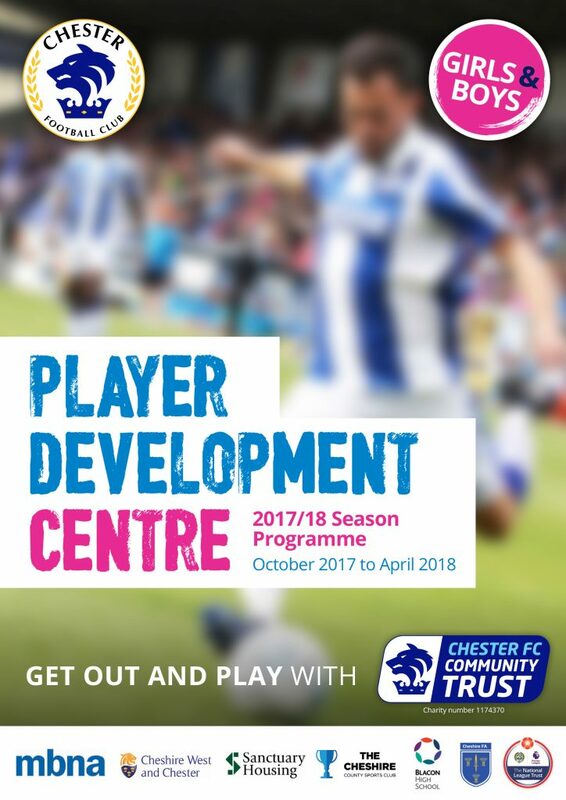 For more information on the Chester FC PDC and to request a registration form email community@chesterfc.com or contact 07512 355396. 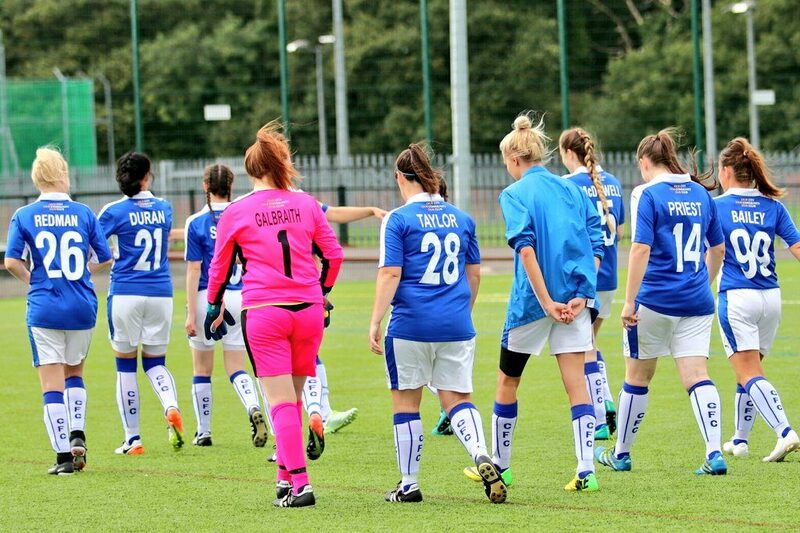 Talented young female footballers are encouraged to register to attend trials for the Chester FC Girls Advanced Player Development Centre (APDC). The APDC is a partnership between Chester FC Community Trust and Cheshire FA designed to support players in their development and to help them reach their potential, bridging the gap between grassroots football and FA Regional Talent Clubs. For the 2017/18 season, the Chester FC Girls APDC will be running the following age groups: U10s, U12s, U14s & U16s. Players successful at the assessment sessions will be invited to the centre to take part in a 20 week training programme where they will be challenged in line with The FA’s four corner model. The programme will feature a minimum of two fixture festivals in conjunction with other APDCs. Players continue to train and play for their grassroots club with the APDC offering them extra coaching on 3G pitches at The Cheshire County Sports Club and Blacon High School. Prospective players who are demonstrating a high level ability playing within mixed or girls club football teams and living within 60 minutes travelling time of Chester are encouraged to register for the trials. The trials will take place at Blacon High School on a date to be advised. Players will require suitable footwear for playing on a 3G surface, shin pads and a drink. For further details about the Chester FC Girls APDC or to request a registration form email community@chesterfc.com or contact 07512 355396. 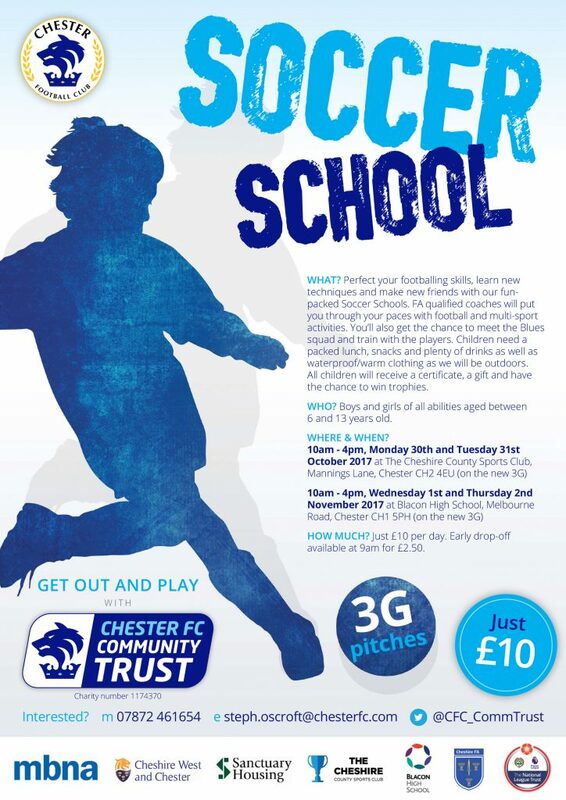 Bookings are now being taken for the Chester FC Soccer Schools taking place this Autumn half-term. The popular courses return following a successful summer with four days of coaching split between The Cheshire County Sports Club in Upton and Blacon High School. To ensure the best possible experience for youngsters, the courses will be taking place on the new 3G pitches at both venues. Chester FC Soccer Schools still cost only £10 per day and run from 10am until 4pm with an optional 9am early drop-off available for £2.50 to make life even easier for parents. Online booking is available through Eventbrite (additional booking fee applies) at community.chesterfc.com/book-online. Each day features coaching drills, games and tournaments with FA qualified coaches from Chester FC Community Trust. All participants will receive a certificate and there will be opportunities to meet new Chester FC manager Marcus Bignot and his squad. Chester FC and Chester FC Community Trust are excited to be supporting the MBNA Chester Marathon on 8th October. The multi–award winning Chester Marathon is the UK’s only international race and the City of Chester’s largest sporting event. On the day, we will be providing a range of free activities at the Racecourse, the start/finish and Big Lupus will also be out supporting the Children’s Mini Marathon. Community Trust Chief Executive Jim Green said: “We are excited to be part of this year’s MBNA Chester Marathon. “We are proud to be a family club and the MBNA Chester Marathon is a real family spectacle and one we’re looking forward to contributing to. Andy White, the Chester Marathon Director, said “It’s great to be working with Chester FC at the MBNA Chester Marathon. Entries are selling out fast for the much loved Mini Marathon, get your aspiring young marathon runners signed up at www.activeleisureevents.co.uk/marathon/mini-marathon. Make sure to Tweet @CFC_CommTrust on the day if you’re a Blues fans running in the marathon! The winner of the #ProudToBeBlue competition for Junior Blues has been revealed and congratulations go to six-year-old Lacey Mills! We receieved lots of brilliant entries of Junior Blues showing off their favourite Chester FC shirt across the UK and beyond. All of the entries were put into a prize draw and Lacey’s name was picked out as the winner. 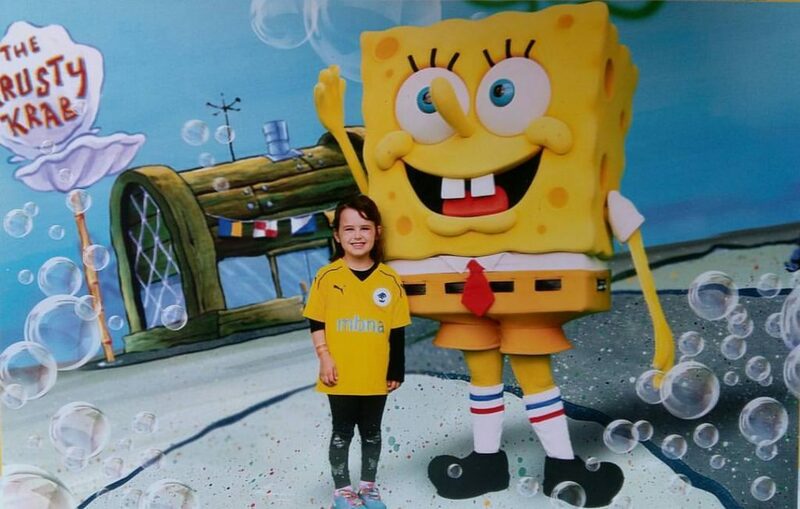 Lacey sent in a fantastic photo of her wearing her new yellow away shirt when she met SpongeBob SquarePants at Blackpool Pleasure Beach. Lacey’s prize is a mascot experience for the game against Eastleigh on February 17th – which we can announce will be the annual Junior Blues Takeover Day! Thank you to everyone who entered #ProudToBeBlue – there’ll be lots more competitions for Junior Blues this season! 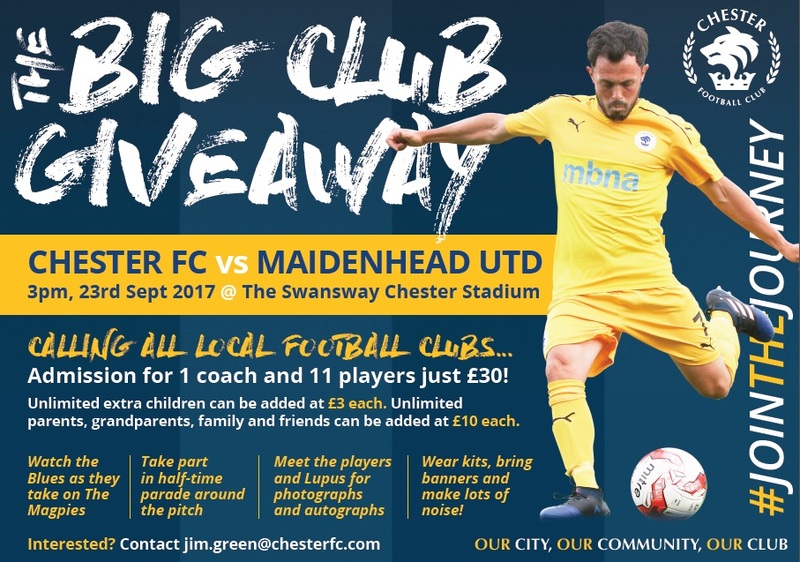 Junior football teams are invited to be part of The Big Club Giveaway when Chester FC face Maidenhead United later this month. The game on Saturday September 23rd will feature a half-time parade around the pitch with teams encouraged to wear their kits, bring banners and make lots of noise to promote their club and create a buzz at the Swansway Chester Stadium. Pre-game youngsters will have the opportunity to meet Lupus, the Club’s mascot, and players for photographs and autographs before cheering on the Blues against the Magpies. Last seasons hundreds of children took part in community parades and this promises to be another day to remember for young footballers, showcasing the fantastic work of junior football clubs in the area. Jim Green, chief executive of Chester FC Community Trust, said: “The response to these initiatives last season was tremendous and it’s a great opportunity to celebrate junior football locally. Admission for a coach and a team of 11 children is just £30. Unlimited extra children can be added at £3 each and parents, grandparents, family and friends can come along and join the fun at £10 each. Clubs wishing to register or find out further details can email community@chesterfc.com or call 07512 355396. 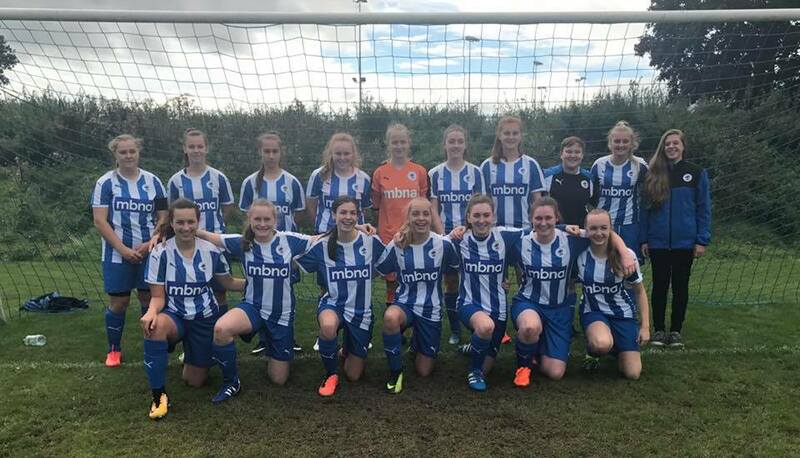 Both Chester FC Women and Chester FC Women U18s registered victories on the opening weekend of the new Cheshire Women’s & Youth Football League season. Having finished in second place last term, the Women’s team are determined to go one better this time around and got off to a solid start with a 2-1 win against Wythenshaw Amateurs at their new home of Ellesmere Port Sports Village. Lauren Stringer gave Dean Vian’s side the lead in the first-half before Debbie Trayner doubled the advantage following the restart, and although the visitors pulled a goal back, the Blues held on for a deserved three points. The U18s have been undergoing a period of rebuilding under manager Ben Richards following a difficult 2016/17 campaign. The hard work of the squad was rewarded with an impressive 5-2 win against Frodsham Girls at The Cheshire County Sports Club. Laura Holmes (2), Ella Tyson, Maddie Higham and Cody Fenlon found the target for the Blues. Jim Green, chief executive of Chester FC Community Trust, said: “The players and coaches have worked incredibly hard over the summer in preparation for this season and there’s a real determination to be successful. “The Community Trust is committed to developing women’s and girls football and as part of that we want our flagship teams to be competing at the highest possible level to ensure young players have something to aspire to. Prospective players interested in joining Chester FC Women or Chester FC Women U18s can email community@chesterfc.com for further details. 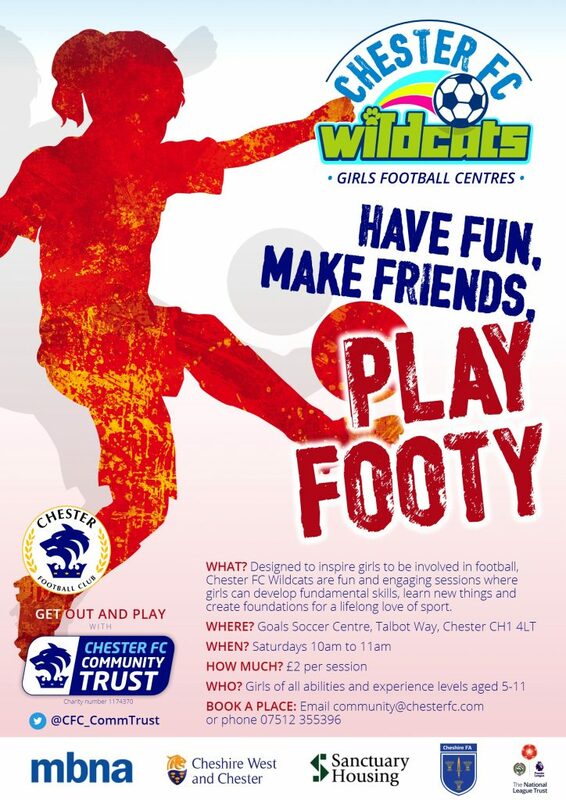 Girls who want to play football can join the Chester FC Wildcats at Goals Soccer Centre on Saturday mornings. Following the summer break, the sessions, which run from 10am to 11am and are open to girls aged 5-11 of all abilities and levels of experience, restart on Saturday 9th September. Coaches from Chester FC Community Trust run the Chester FC Wildcats sessions, providing a safe environment where girls with no football experience can have fun engaging with sport, develop fundamental skills, try a variety of sessions, learn new things and create foundations for a lifelong love of sport. Chester FC Wildcats also run weekly sessions in Ellesmere Port on Wednesday evenings at Ellesmere Port Sports Village from 5pm to 6pm. Sessions at both centres cost just £2 per week and there are progression routes to community clubs for those girls who wish to play in matches. For further details about Chester FC Wildcats or to book places in advance email community@chesterfc.com or contact 07512 355396. 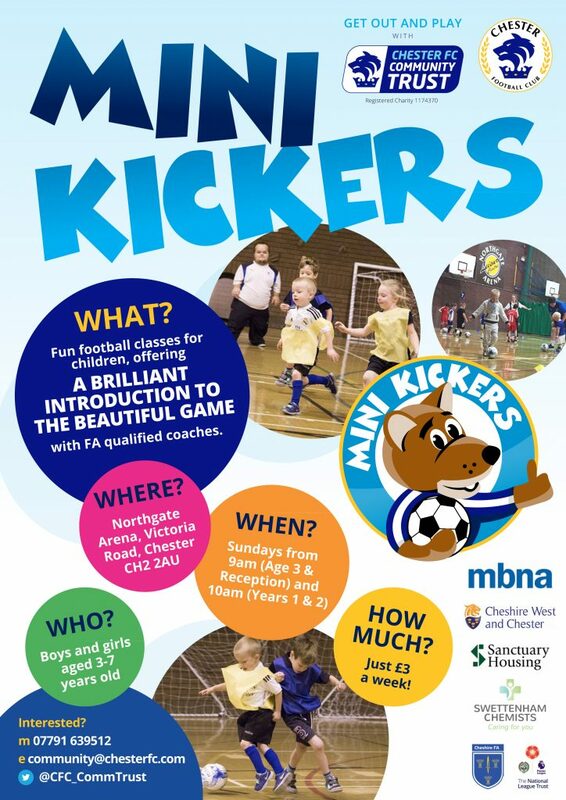 Chester FC Mini Kickers is back for the new season and promises to be bigger and better than ever! These fun football classes for children aged 3-7 offer a brilliant introduction to the beautiful game with FA qualified coaches from Chester FC Community Trust. Mini Kickers restarts on Sunday 10th September and there are a number of exciting changes for the new season with new Mini Kickers branding, free Junior Blues membership for three and four-year-olds and new progress certificates as children develop their skills! Each session is designed to be fun and exciting with individual and group activities, challenges and games, introducing and developing core football skills and technique such as control, passing and shooting. Mini Kickers also helps to build confidence and supports the development of fundamental movement and social skills. Classes cost just £3 per week and there are no joining or registrations fees and no need to pay in advance. Children can be registered 15 minutes before classes start, however parents who wish to guarantee places are advised to book in advance via community@chesterfc.com or on 07512 355396.